At the eastern end of the bay of Mazarrón, at the foot of the imposing bulk of Cabo Tiñoso, the shoreline curves round and becomes stony with small sandy patches for a distance of approximately 800 metres. This is the Playa de La Azohía, eschewed by some on account of the pebbles under foot but adored by others for the clarity and calmness of the water. As a result it is slightly quieter than other beaches, despite being well served by the bars and restaurants immediately behind it, although in the area near the fishing jetty and the church more people tend to congregate. 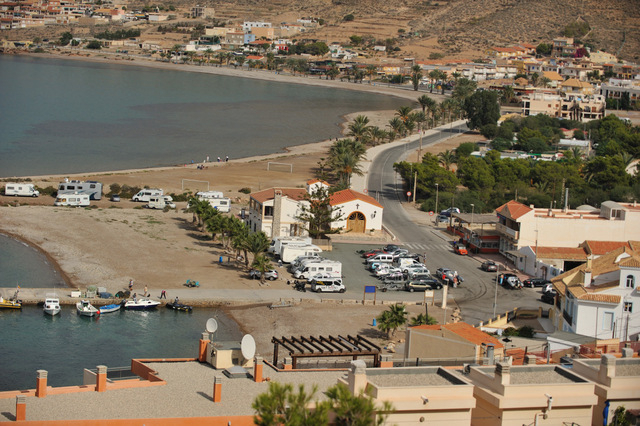 Parking here is normally not too difficult alongside the main road, although of course in summer the area becomes more crowded, especially in the early evening as people gather at this end of the bay to enjoy the sunset over the mountains and the Puerto de Mazarrón. 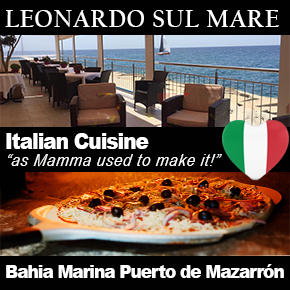 The beach is also known as the Playa del Cuartel, after the Guardia Civil headquarters (or “cuartel”) which used to stand on the plot of land next to the restaurant at the curve in the road. That plot has now been empty for decades, but the name has “stuck” and in many guides this is the name under which the beach is listed. 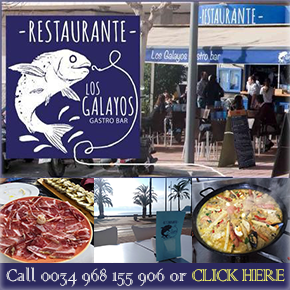 The Playa de La Azohía is approximately 500 metres from the eastern end of the sea-front walk which runs 5 kilometres between the churches of La Azohía and Isla Plana, and is also around five minutes’ walk from the village’s small supermarket. Another very small store is closer at hand just inland from the beach itself, adjacent to one of the dive schools. 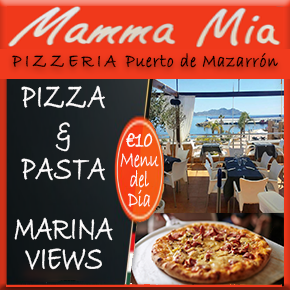 This area has been popular with Spanish holidaymakers for decades, and still retains a characterful charm which gives it a pleasant, homely family holiday feel, tending to attract those who prefer a welcoming air of community to mod cons and fashionable amenities. 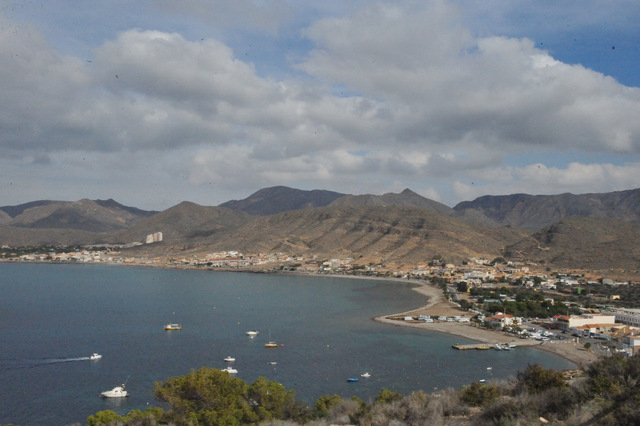 A run of mostly “natural” beaches stretches for kilometres along the curve of the bay of Mazarrón, and many tend to assume automatically that La Azohía and Isla Plana are actually in the municipality of Mazarrón, although they are in fact at the western end of Cartagena. 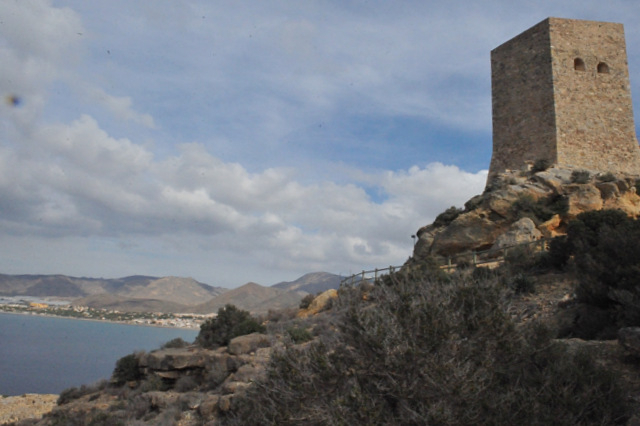 Perched atop the headland behind La Azohía is the Torre of Santa Elena, built to warn of impending pirate attack, and offering a fabulous viewing point from which to look out over the bay, from this corner of shingle around to the crowded urban beaches of the Puerto de Mazarrón. 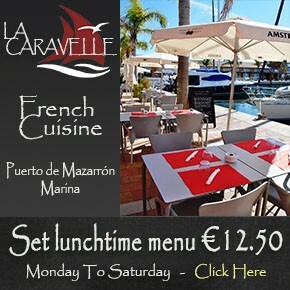 This small corner of La Azohía is busy in the summer, as it boasts a launching ramp and solid stone jetty with purpose built slipway which is used by all and sundry to launch sporting boats into the Mediterranean. The jetty was purpose built to unload the building materials and armaments which form part of the chain of military batteries surrounding and protecting Cartagena. High above La Azohía is one of the most spectacular batteries which can still be visited today: Castillitos, with its vast Vickers anti-shipping guns still in position. These were dragged up the twisting road to their current position by teams of mules after landing here at the jetty of La Azohia. La Azohía also boasts a small church and various bars and restaurants, and parking is normally not hard except at weekends in summer. 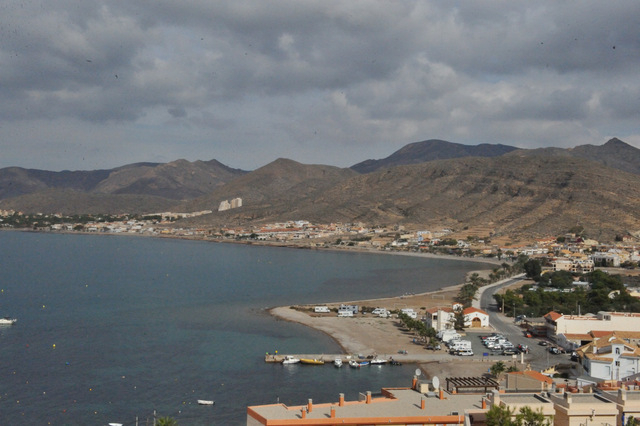 Buses run along the coast on the Mazarrón - Cartagena route. Diving is popular in this corner of the coastline, with some truly excellent diving to be enjoyed in the clear waters of the rocky bays along this coastline. Snorkelers also love the corner of the little beach area near to the jetty, with plenty of interesting marine life to be found amongst the rocks and crevices at the foot of the Cabo Tiñoso.